Broken heart (base photo by Alex Bruda, Freeimages.com; filtered by author). 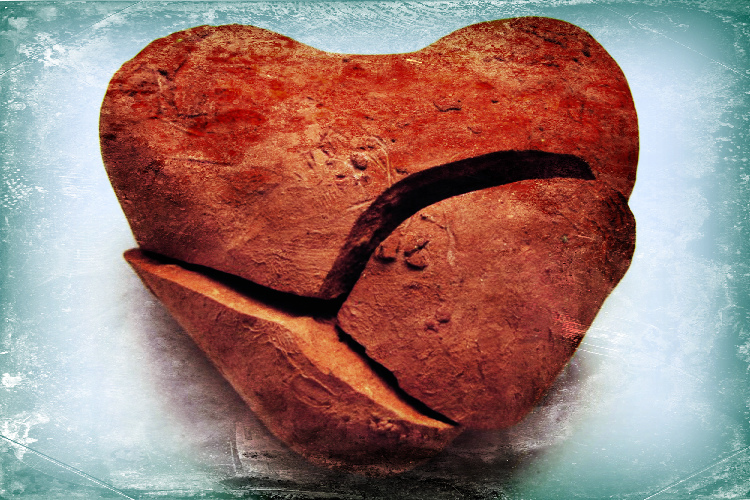 Did you know that the everyday expression “broken heart” (or “brokenhearted)” is considered to be derived from the Bible? Yes, even by secular sources. If you read your Bible you may already know that expressions such as going to the “land of Nod,” or having “feet of clay,” are not from fairytales or other old works of fiction. In fact, very many idioms, phrases, and expressions in the English language originated from the Bible. This post holds a good number of them (but not all)–27–chosen specifically for their commonness. Some are so common that I not only made the list and checked it twice (see what I did there? That phrase is from the 1934 song “Santa Claus is Coming to Town“), but thrice. The blind leading the blind. The biblical meaning may imply willful ignorance, but the saying today refers more generally to the uninformed blindly following the uninformed. “But [Jesus] answered and said, ‘Every plant which My heavenly Father has not planted will be uprooted. Let them alone. They are blind leaders of the blind. And if the blind leads the blind, both will fall into a ditch'” (Matthew 15:13-14). By the skin of your teeth. Some explain this to be referring to the film you can feel on your teeth when they’re not clean, and thus, being saved in whatever situation by the ultra-slimmest of margins. “My bone clings to my skin and to my flesh, and I have escaped by the skin of my teeth” (Job 19:20). Fight the good fight. This has come to mean making a purposeful effort to work on behalf of a morally right cause. Originally it referred to the struggle to maintain one’s faith: “Fight the good fight of faith, lay hold on eternal life, to which you were also called . . .” (1 Timothy 6:12). Fly in the ointment. This saying alludes to plans that are spoiled by a small thing, but as can be seen by the original verse below, it was meant to convey that bad behavior by an otherwise honorable person can raise questions about their true character. “Dead flies putrefy the perfumer’s ointment, and cause it to give off a foul odor; so does a little folly to one respected for wisdom and honor” (Ecclesiastes 10:1). Labor of love. When you feel a strong purpose toward non-paid work you’re doing, then it’s a “labor of love.” “God is not unjust to forget your work and labor of love which you have shown toward His name . . .” (Hebrews 6:10, and 1Thessalonians 1:3). Land of Nod. The Land of Nod is the place where Cain was exiled to for having murdered his brother; it has nothing to do with sleep, which it means in speech today. We can only guess, but perhaps it comes from the idea of being spiritually asleep after being cast from God. “Then Cain went out from the presence of the Lord and dwelt in the land of Nod on the east of Eden” (Genesis 4:16). See eye to eye. Seeing eye to eye isn’t referring to a staring contest, but that people see something in the same way–that they agree. “Your watchmen shall lift up their voices, with their voices they shall sing together; for they shall see eye to eye when the Lord brings back Zion” (Isaiah 52:8). A thorn in the flesh. Today, this simply refers to something that is continually annoying. The apostle Paul had a specific irritation, however, when he wrote: “And lest I should be exalted above measure by the abundance of the revelations, a thorn in the flesh was given to me, a messenger of Satan to buffet me . . .” (2 Corinthians 12:7). My favorite modern take on this can be found at Redjaw Cartoons. Writing on the wall. This expression means that something bad is about to happen. It is from the spooky story in Daniel chapter 5, but here is an excerpt. “This is the inscription that was written [by a supernatural hand]: MENE, MENE, TEKEL, UPHARSIN. This is the interpretation of each word. MENE: God has numbered your kingdom, and finished it; TEKEL: You have been weighed in the balances, and found wanting; [UPHARSIN and] PERES: Your kingdom has been divided, and given to the Medes and Persians (verses 25-28). A bird in the hand is worth two in the bush. This exact expression in its current form is not in the Bible, actually, but a similar biblical phrase is considered to be the first in English that means the same thing. This may seem a bit wanky, but I’m conveying what at least some etymologists say. The meaning of this phrase – to have something you know is good is not worth throwing away for things that may or may not be better – has equivalents in many languages. The phrase from the Old Testament is found in Ecclesiastes 9:4b: “A living dog is better than a dead lion.” The oldest written phrase close to its current form is found in an ancient source, but not nearly as ancient as the OT: “He is a fool who lets slip a bird in the hand for a bird in the bush” (Plutarch, c. AD 100, in Of Garrulity). As old as the hills. Meaning “very old indeed,” this expression is a shortened version of Job 15:7: “Are you the first man who was born? Or were you made before the hills?” A similar but more specific expression is “As old as Methuselah.” This is referring to the oldest recorded person in the Bible, Methuselah, grandfather of Noah, who was said to have lived 969 years (Genesis 5:27). Cast your bread upon the waters. This is a less common saying nowadays (and is even absent from references), perhaps because it seems too nonsensical and doesn’t convey any meaning by itself. I love the sound of it, though, so included it here. It’s from Eccl.s 11:1: “Cast your bread upon the waters, for you will find it after many days.” Though the saying doesn’t seem to make any sense, it is an expression that hopes to invoke patience or diligence. Set your teeth on edge. When something is upsetting or making you uptight, you might say that it’s setting your teeth on edge. This comes from a few verses in the Bible, like Jeremiah 31:29, “In those days they shall say no more: ‘The fathers have eaten sour grapes, and the children’s teeth are set on edge'” (see also Jeremiah 31:30 and Ezekiel 18:2). Charity begins at home. Interestingly, this expression doesn’t come from an obvious notion or ideal, but from a criticism of men (providers of the family) having problems with being a good provider. 1 Timothy 5:8 states: “But if anyone does not provide for his own, and especially for those of his household, he has denied the faith and is worse than an unbeliever.” Jesus talks of hypocrisy in a number of places in the New Testament, especially in Matthew 23, but what he says in Matthew 15:1-9 is particularly applicable here: “But you [scribes and Pharisees] say, ‘Whoever says to his father or mother, “Whatever profit you might have received from me is a gift to God”— then he need not honor his father or mother.’ Thus you have made the commandment of God of no effect by your tradition. Hypocrites!” (15:5-7a). 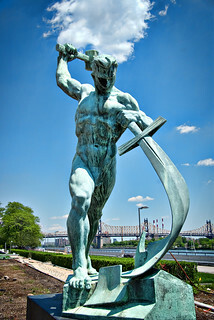 Let Us Swords into Plowshares (Photo credit: Singing With Light) At U.N. Headquarters, N.Y. Note: Updated August 4, 2014. A larger part of this article was first published at Yahoo! Voices. It was integrated with a similar article here after Voices closed shop in 2014 and reverted all rights back to the original authors. Edited slightly on 10-8-2014.